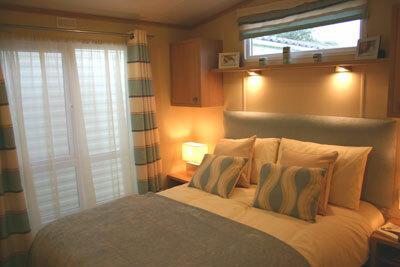 The two bedroom St Moritz is an open plan holiday home which comes with full central heating. 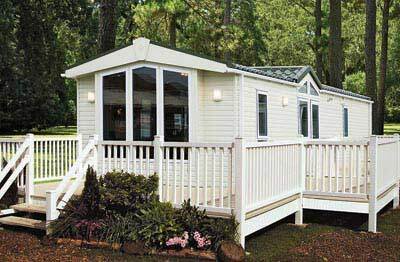 It has been built by Pemberton, one of the industry’s leading manufacturers of holiday homes with some 60 years experience in the design and manufacture of holiday homes. The main feature of the lounge is the large window unit in the end wall with the banquette seating below it. To the left – at 45 degrees – is a false wall on which the electric fire has been mounted. Above the fire the wall has been blocked to take a flat screen TV, whilst the L shaped seating arrangement incorporates a sofa bed. Behind the leg of the L shaped seating is a base unit and worktop forming part of the U-shaped kitchen. 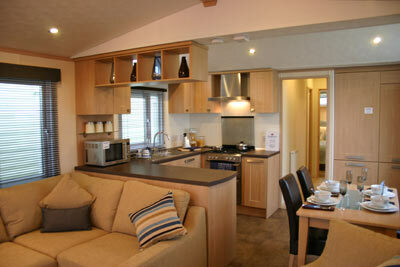 Opposite the kitchen are the dining area and the holiday home’s entry door. The dining area has a table and four chairs as standard but could take another couple of diners without any real difficulty. Standard kitchen equipment includes a stainless steel cooker with a separate oven and grill (both with electronic ignition), a four burner hob with an overhead extractor, a microwave oven and a fridge/freezer. There’s a good supply of floor and wall cupboards, plus plumbing for a washing machine or dishwasher. A door from the kitchen leads into the hallway and the night time accommodation. Immediately on the right is the shower room which has a shower cubicle stretching the full depth of the room; and there’s plenty of toiletry storage in the mirror door wall cabinet above the pedestal washbasin next to the low level toilet. The second bedroom is big enough for two single beds. The designers have included a row of cupboards above the beds, together with a small wardrobe and two drawers opposite the foot of one of the beds. The result is a bedroom which is more than adequate. The main bedroom is one of the St Moritz’s best features. It has a double bed, a dressing table with a mirror on the wall above it, plus a built-in four door wardrobe, two doors of which each have three framed mirrors. Next to the wardrobes is the door to the en suite toilet. This has a corner pedestal washbasin with a corner mirror door wall cabinet above it. Small but adequate sums up this en suite. 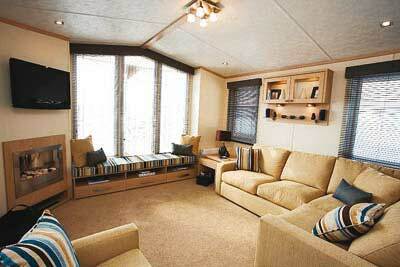 The St Moritz is a holiday home which should offer years of trouble-free holiday living. 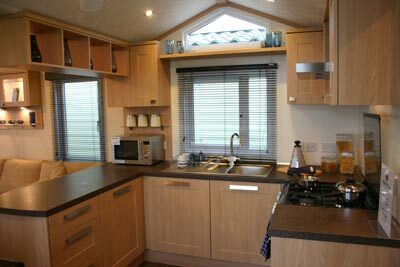 It is built to BS EN 1647 standards and comes with full central heating making it suitable for holidays throughout the year.